“A little while longer and the world will see Me no more, but you will see Me. Because I live, you will live also. At that day you will know that I am in My Father, and you in Me, and I in you” (John 14:19-20). As I was studying and praying this morning, I felt like the Lord wanted me to tell you this: There is a resurrection coming. Because Jesus Christ is the Resurrection and the Life. He is Resurrection Personified. And Jesus is in the Father, and we are in Him, and He is in us. Let me say that again: JESUS IS IN YOU. And Jesus is the Resurrection. That means Resurrection Personified is in you. And if Resurrection Personified, Jesus Christ, is in you, then by default He will manifest Himself as who He is. You have been through absolute hell. You’ve been through a nightmare lately. But Father wants you to know that not only does Jesus live in you, and you in Him, but also the same Spirit that raised Jesus from the dead dwells in you. And Jesus and Holy Spirit are in agreement about the work of resurrection in your life. And They are, right now, raising you up. Let your faith grab onto that. Receive it for yourself. Grasp in faith the wonder of Resurrection Personified living in you, and how if He is Resurrection, then He must needs manifest His resurrection in YOU. Weeping may have endured for the night, beloved, but joy is coming now. The storm is over, beloved. “Because I live, you will live also.” It’s all in who Christ is. 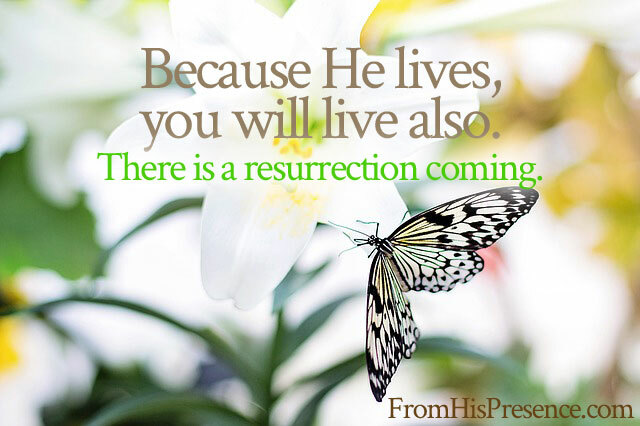 He is the Resurrection and the Life, and He is manifesting Himself as Resurrection and Life in YOU, right now. Does this word confirm something God is telling you also? Please leave a comment below! Is Holy Spirit speaking to you through this message? Is He challenging you to pray? If so, please leave a comment below. I’d love to hear from you! Thank u for that word! I pray God would continue to encourage you today, Juanita! Amen !! Wow this is a powerful word I believe it and I receive it !! Amen and amen! Thank you for reading, dear Michelle! Thanks for reading, Leah! I hope you are well! That’s pretty amazing. Thank You, Lord. Wow. Thank you precious Jamie. Lifting you too. Amen! I had not thought of that song, but yes, yes, yes! Please pray for me and my family. I love my mother dearly but we can’t get along. She acts as if she hates me. She adores my brother on the other hand. We all live together. And I’m a very forgiving person. I forgive her and pray for us but it doesn’t get better. I’m so afraid and fear trying to talk to her because I feel she will attack me again. Rhonda, I am so sorry you are going through that. I do pray God would help you to forgive like Jesus forgives, and that He would protect you, and that He would give you wisdom regarding all the practical steps to take so you can be in a healthy environment, in Jesus’ name. It speaks to me Jaime, ” You’ve been through absolute hell, you’ve been through a nightmare lately. ” I can relate to that. This morning, as I prayed, the phrase the battle belongs to the Lord came to mind. But last night as I prayed in the Spirit, I could see a little girl, bald, obviously a cancer patient, she must have been dying but the Lord was saying, ” Go back, go back. ” Resurrection power and life is in His name, plead the blood, hold on. Anyone with sick children or women in a crisis, please hold on. Amen. May healing and life come swiftly in Jesus’ name. I thank you for this word today. I do believe there is a big change coming in my life. May God bless you and your family. I thank you again. Amen. Thank you for reading, Millie! I pray in agreement that Papa God would make all things new for you and yours, in Jesus’ name. Because I live you will live also. Amen. Yes, joy is coming. I claim victory in Jesus sweet name. God bless you Jamie for the love of God that you share with us all. Thank you, Pauline. Yes, it’s all about Him! Jesus is our Hope Incarnate! Emmanuel! I have took a big leap of faith. I’m a single mother no child support. I quit my job with no income coming in and no job lined up. The job I had I was struggling to do the things of God. I never seen my daughter. I’m in a play at church. I was missing play practice. I was not happy. So I said God I belong to you and I will not miss out on the things of you. You know my heart and the hours I need. I’m trusting God. He loves me. I’ve never done anything like this before. But I’m at peace with it . That’s not like the old me. I pray you would be blessed as you step out in faith, Fonna. Thank so much Jamie for allowing God to touch His people. On Thursday I asked my friend to stand with me in prayer for two hours on Saturday morning. I wanted God to speak to me on an issue in my life. When I checked my phone after prayer . I received God’s word through you. Praise God I am in Western Australia. Wow, that is amazing. Thank You, Abba Father, for encouraging my friend! I claim this Word and am thankful to receive it. I have been through hell for the past three months as I have watched a loved one slip into the clutches of the enemy and I have been praying night and day for God to manifest His victory and deliver His lost sheep. Those words have lifted my spirit and reminded me that I have to speak glory into this situation. Thank you so very much. Sarah, I am so sorry you have been through that. I pray that every wandering soul you care about would return quickly to the Father’s embrace, in Jesus’ name. Such soothing song, the storm is really over! We have a living God with us. Taking care of us, because He lives we are also. Jamie God bless you with such insight of the Word. Yes, He is so good! And I’ve been listening to that song over and over. Such a beautiful message. Thank You, Lord! So glad it helped! Thank you for reading my blog! that waves of love flow that brings sheer delight through out the day. Thank you so much, and amen! I absolutely receive the resurrection that my family and I so deeply trust Abba for. I pray blessings over you and your loved ones too! Thank you, Kara! I am so glad Papa encouraged you today through this post, and I receive those prayers and blessings! May you also be blessed exceedingly in all things today and throughout this season. Yes God gave me the verse John 11:4 before my divorce was final that it was not unto death but for the glory of God. So this weird speaks exactly to what Good had said to me. I have been hanging on and just waiting. Thank you for your timely words.